2013 Chateau Valcombe “Les Hauts de Valcombe” Ventoux Rouge, Rhone, France. The Valcombe vines are about 75 years old and sit low on the slopes of Mount Ventoux, they are farmed organic and are used to produce traditional wines of balance and finesse, they are crafted by Luc and Cendrine Guénard, a couple that want to grow the reputation here and have a great passion for their terroir. They studied under Paul Jeune of Domaine Monpertuis, famous for his gorgeous Chateauneuf du Papes, and they have Rosenthal imports firmly behind them and championing their wines here in the states, their estate in at 1,000 Feet and covers about 28 hectares of mostly old vine Grenache with Syrah, Carignan and Cinsault for reds and as well as a collection of white grapes. 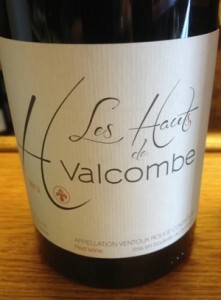 The 2013 Les Hauts de Valcombe is a sappy and spicy red with great detail and vitality, it is open, but brilliantly subtle and refined with loads of charm that highlight the chalky mix of soils that include blue clay and galets, the same round stones found in Chateaneuf, and the palate is easy with red spices, dried flowers, earth and light leather notes adding complexity to the black raspberry, plum and pomegranate fruit core along with cracked pepper and red spicy cinnamon. There is a stony and stylish savory side that comes through as well as a lingering blueberry and strawberry on the finish, and the whole is a pleasing and easy to love red from one of the most underrated areas of the Rhone, where you can discover real beautiful wines that offer superb value, like this one, drink the Les Hauts de Valcombe between 2015 and 2018, it’s lovely stuff.